"You came here to be scared, right?" CBS Films has debuted the first teaser trailer for a horror movie titled Hell Fest, about a horror theme park that becomes a killing playground for a masked serial killer. We haven't seen a theme park horror movie in a while, so this is good to get one in the mix again. "A terrifying thrill ride from iconic horror producer Gale Anne Hurd and director Gregory Plotkin (Paranormal Activity: The Ghost Dimension), this September audiences will discover that it’s fun going in… but it's hell getting out." This stars Amy Forsyth, Reign Edwards, Bex Taylor-Klaus, Christian James, Roby Attal, and Matt Mercurio. The most terrifying part is that everyone at the park thinks all the kills are just fake and for fun, but no one knows hwat's really going on. Oh damn. It's a scary first teaser for this horror. 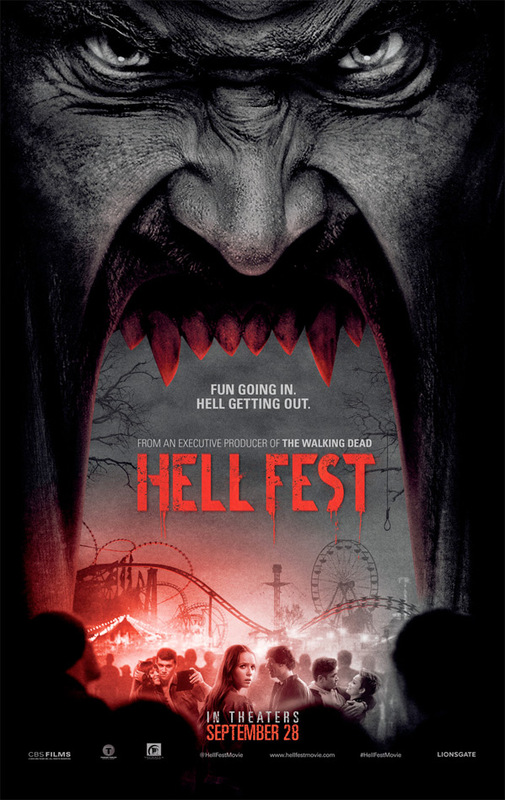 A masked serial killer turns a horror-themed amusement park called "Hell Fest" into his own personal playground, terrorizing a group of friends while the rest of the patrons believe that it is all part of the show. Hell Fest is directed by filmmaker Gregory Plotkin, director of the film Paranormal Activity: The Ghost Dimension previously, after working for years as an assistant editor. The screenplay is written by Seth M. Sherwood & Blair Butler, with Stephen Susco and Gary Dauberman; from a story by William Penick & Chris Sey. This has yet to premiere at any film festivals or otherwise. CBS Films will release Plotkin's Hell Fest in theaters everywhere starting September 28th later this fall. First impression? Who wants to visit?